"Like many of you, we want to stay connected to our loved ones and to our friends and family around the world. Christmas cookies are more than just baked goods. They are a tangible and tasty link to our past, our traditions, and our memories. They are gifts hand-made with love especially for their recipient." Kristin Johnson and Mimi Cummins have created a festive book filled with recipes, stories and tips for making unique holiday gifts. Kristin and Mimi lived next door to each other when they were young children and remember the scent of cinnamon, cookies baking and eating cookie dough. Kristin is an award-winning writer who has written about food online and is famous for her cookie-baking. Mimi Cummings is an avid cookbook-reader and recipe tester. She has worked with professional pastry chefs and also created Christmas-Cookies, a website for her grandmother's legendary Christmas cookie recipes. Her site is now the most comprehensive repository of Christmas cookie recipes on the Internet. You can also look for favorite Christmas recipes at the Cookie Exchange forum and even submit your favorite cookie recipe. 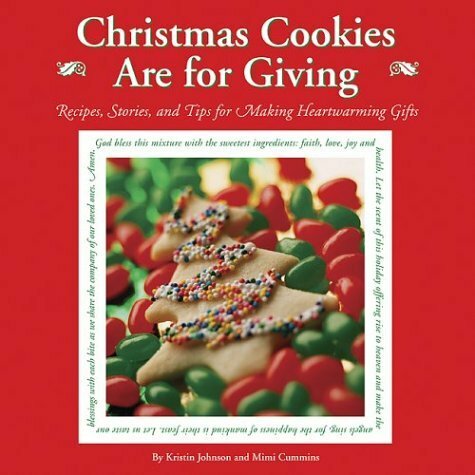 "Christmas Cookies Are For Giving" is filled with cooking advice, Christmas stories, cookie recipes and inspiration. You will find heirloom recipes from family and friends, brand-new original recipes, recipes developed by chefs and even a few recipes from Kristin and Mimi's favorite food promotion organizations. Some of the traditional recipes date back to before Mimi and Kristin's ancestors immigrated to the United States. Each recipe has a full-color photograph to inspire a festive mood and a shopping trip to buy ingredients! Most of the recipes include ingredients you will already have in your kitchen, but you might want to go shopping for mason jars, ribbon and fabric to make the "Cookies in a Jar." The Giving Christmas Cookie - A poignant story about a woman's memories of Vanillekipferl (Vanilla Crescents) from Vienna and how her recipe leads to bringing Christmas spirit to her community. Christmas Cookie Baking: Tips and Hints -Anyone who is new to baking will appreciate these tips. There are also tips for using the best ingredients and using insulated cookie sheets, which I can also say are highly recommended. Christmas Cookie Recipes - The recipe for "Vanillekipferl" made with blanched almonds, sugar and vanilla. This recipe also shows you how to make vanilla sugar. 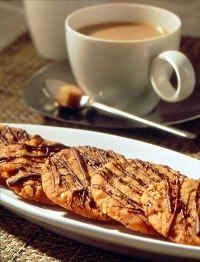 There are recipes for everyone from the gourmet coffee connoisseur to art lovers. Children will love the "Cathedral Windows" and "Butterball Santas." 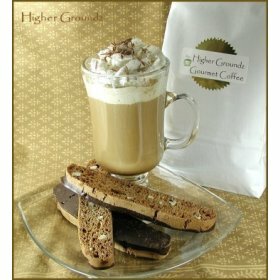 Coffee lovers will enjoy the "Walnut Cappuccino" or "Cherry" Biscotti. "Cranberry Spice Bread" is perfect for shipping to friends and family. 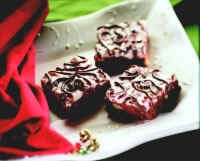 Just wait until you see the picture for the "Chocolate Cranberry Holiday Bars" and "Pistachio Cookie Tree." The recipe for "Speculaci" includes a story and information on how to paint cookies. You can use the Royal Icing on pg. 130. Christmas Cookie Gift Presentation - Delicious ideas and great suggestions for making up cookie baskets with additional treats. You might want to include copies of this book to encourage the "giving" tradition. Shipping Christmas Cookies - What type of cookies can you ship? How do you package them and how do you ship them? Gifts in a Jar - Great idea if you don't have time to bake. You just pour layers of ingredients into a jar and decorate in a festive way. Christmas Cookie Stories - The first story is an amusing story about a woman whose marriage is based on Springerle. I believe it after seeing the look on my husband's face when I tried to change a chocolate chip cookie recipe he loves. He won't eat them now unless they have Muscovado sugar in the mixture! There is also an adorable and very amusing story of how a three year old makes her first Christmas cookies. This is the type of cookbook you want to read while sipping a cup of tea while wrapped up in a down comforter by a fireplace. This cookbook is the most meaningful book I've read this year. It brought back my own memories of my grandmother baking more cookies than we could ever eat in one holiday season. I remember Christmas cookies stored in cookie tins that always tasted like they had just been made. She was famous for always keeping a few cookies hidden in tins for tea after the holidays. Since no one in our family seems to make as many cookies for the holiday season, I've tried to carry on this tradition by making tins of cookies for my family each year. This book has given me some new ideas and I even found the recipe for "Cathedral Windows" that my aunt makes each Christmas. "Christmas Cookies Are For Giving" is filled with Christmas spirit, loving memories and delicious buttery cookie recipes! If you are looking for a Christmas gift for your friends and family, this book is more than a cookbook, it is a wish for future holiday memories. © 2003 Wisconsin Milk Marketing Board, Inc.
For reading or relaxing, The Classic Chillout Album creates a comforting ambience. The selections are soothing and keep to a consistent laid-back mood. There is enough variety to keep you relaxed and entertained. Classics like Sade's Ordinary Love are instantly recognizable and Sweet Lullaby by Deep Forest invites in the exotic. The album begins with more edgy selections and then turns romantic and sensual at the end, making this perfect to listen to with someone you love. Perfect as a relaxing background while giving massage, reading books in bed or for escaping into a relaxing bath. Play this on your stereo while you watch a fireplace DVD and curl up with a good book. Hot chocolate with whipped cream and freshly grated nutmeg, optional, but comforting.